Ted, Justin, and I got together for a run sometime in mid-August. As we headed out, Ted tossed out the suggestion to form a team and run a series of local college cross-country races. Considering that I'd been running but not really training, I gave him some non-committal answer like, "Sounds cool, I'll think about it." We ran on. It was a brutally hot day, and we were all struggling a bit. None of us was in great shape, drained physically and psychologically by the Nashville summer. By the end of the run, I was just glad to be done, feeling totally flattened by an easy 6 miler. Afterwards, Ted asked again if I was up for racing. "Maybe," I said. Ted just sorta looked at me for a few moments, then he said this: "When your college coach told you there was a race coming up, did you tell him that 'maybe' you'd be ready? Hell no, you got on the line and raced." Put it on the line. So, this was how I found myself two weeks later dressed in a white singlet and black shorts, sporting a glaringly new pair of XC spikes, standing on a white line in a huge dusty field with a bunch of kids approximately half my age. It was 95 degrees at 6pm. We had cobbled together four friends who regularly train together: me, Ted, Dan, and Ryan. Justin's flight had been delayed, so we scrambled to find a 5th man to round out the team. One of Ryan's former college teammates agreed. I gave him a singlet and a number. He took them, saying "Thank you, sir." "Sir?" Really? The kid did look pretty young, I guess. The usual feelings returned standing in the box waiting for the gun. Nervousness, acid in the legs, thoughts about pacing. The starter gave a set of instructions. It would be a two-count start; the old familiar words: "Runners set!" The gun. We were off. Most everybody took off quicker than I did, although I set out quicker than I usually do, trying to stay in contact. I could smell the bodies as we trampled through the first 600m, across a narrow bridge, around the first turn. It had been forever really, since I had found myself in this situation: in a thick pack of runners. I let myself be carried along, and in an instant we were through the first mile. Somebody yelled out: "5:25!" The pace felt fast, but I felt good. 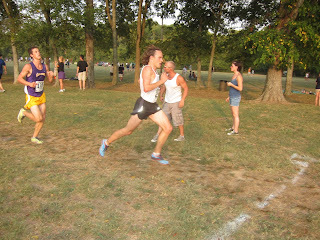 I concentrated on moving up, since I knew many runners would have gone out too fast in this first race--particularly the new freshmen trying to impress their teammates and coach. Sure enough, I steadily passed people the whole second mile, kept running hard. I was at the back of the middle pack of runners, moving up closer to the middle. The front runners were kicking up the light layer of clay and dirt that covered the summer-baked ground. I was literally eating their dust. I missed the second mile split, but it didn't matter. Nothing left to do but run hard. The last mile heads downhill and through the crowd. I did what I usually do: faked feeling strong, faked running hard, convincing myself over and over again despite all evidence to the contrary--dust caked throat, burning quads, cramping calves, hollowed vision--that I was feeling great. A half mile to go. A quick left turn left us 400m to the finish. I was back with the 800m runners who were just doing XC to stay in shape. A couple of them hurtled past me, kicking outrageously hard. I shoulda kicked harder: the clock turned to 17:00 as it swung into view, 17:01 as I crossed the line. I finished 60th out of 100 runners. In the chute, there was the gasping and jostling, the ripping of tags, the whirl of oxygen depletion. We staggered out into the crowd. Ted had finished 30 seconds ago and was still doubled over. My sweet wife brought us cool water. The race was run. It was really fun. Our team finished 8th out of 11 teams. I was 4th runner. I'm hoping that over the next month or so I can get in shape and close the gap to Ted. That's the story of my first college XC race since 1999. Thanks, Andre. Good luck to you! Well done sir! (you get used to the sir thing after a while, it's ineveitable so just roll with it Jeff) Very much looking forward to the reports on your upcoming efforts. Nice shoes! Are they suede? I wish I could have seen you race XC again. I'll practice my hollering if you practice your kicking. how come you old guys are allowed in the race? is it, like, an open or something? I am soooo jealous... 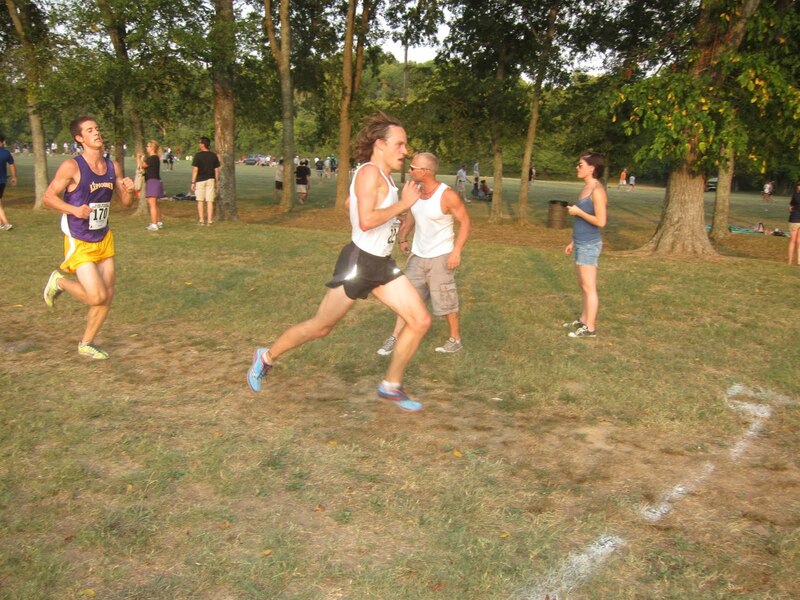 If there's one thing I miss in running, it's the XC races as part of a team. Well done, congrats, and let's hope this reignites a spark in us (because I need it bad). That's awesome - way to get out there! That's a good pic with you leaning forward and the guy you've passed totally back on his heels. "I did what I usually do: faked feeling strong, faked running hard, convincing myself over and over again despite all evidence to the contrary--dust caked throat, burning quads, cramping calves, hollowed vision--that I was feeling great." Maybe I should have given you the 8 ball. @ Mom--you were a much better XC Mom than I ever was an XC runner. @ ace--you just ask the meet officials. Everything is surprisingly low key. We did it all the last week. If you don't have a team, you can run unattached. I agree, it was AWESOME. @ Scout--I heard there are XC meets like everywhere dude. @ Jamey--I thought the same thing. Then I thought what the hell am I doing back there with dudes that run like that! @ Candice--No magic 8-ball for times that begin with 17. No no no. It is not permitted.